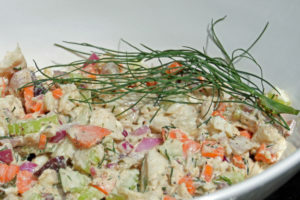 Felicia’s Summer Fish Salad is a refreshing treat that’s easy to make and perfect to serve on a hot summer day – or any other day of the year. This recipe incorporates fresh herbs you may already have growing in your garden and can be made from leftover or poached fish (see below). Great for sandwiches, delicious in lettuce wraps and scrumptious on crackers, it’s tasty, refreshing and the perfect light lunch if served cold on a sultry summer day. Combine all salad ingredients and chill before serving. Pat fish dry and season with salt and seasoning. Heat butter over medium heat and add onion and a pinch of salt. Sauté until softened, about 7 minutes. Add wine to deglaze pan. Add fish, herbs, lemon and enough water to cover the fish. Lower heat to a gentle simmer and cook for 10 minutes. Cool before adding to fish salad.